Maybe Sarkodie should add prophet to his long titles as the rapper’s industry prophesy has come to light live and crystal. Shatta Wale has indeed fulfilled Sarkodie’s prophecy that he will one day show his buttocks to the public. 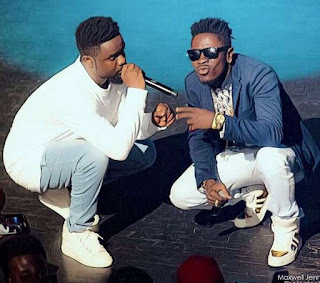 Award winning Rapper, Sarkodie went hard on Shatta Wale in his freestyle song titled ‘Advice’ in which he jabbed Shatta Wale for being insolent. And the prophecy has come to pass as Shatta Wale has been seen in a video showing his buttocks on stage in Dusseldorf (Germany). In the video trending on social media , Shatta Wale is seen on stage showing his buttocks to the fans while they cheered him. Sarkodie’s advice was undoubtedly the biggest diss song to Shatta Wale in Ghanaian music industry. We know many will say the Ghana is a village hit maker did this deliberately to trend, however is clear that Sarkodie’s advice is really picking a great toll on him. Watch the video below .